IF YOU met Rachel Kerr on an ordinary day, you'd have no idea that she's been living with a chronic illness since she was 17. 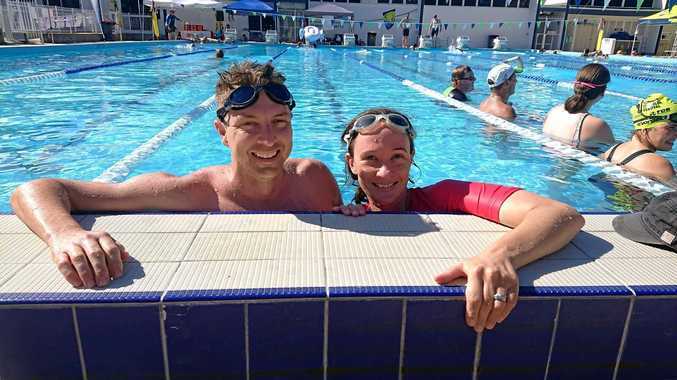 Increasing the understanding of this invisible illness, and raising funds for locals living with the condition, is one of the main reasons Ms Kerr is the passionate face of Rockhampton's MS Swimathon. Multiple sclerosis (MS) affects the central nervous system, interfering with nerve impulses within the brain, spinal cord and optic nerves. The result is an array of symptoms, which Ms Kerr explained could take many different forms and were often not noticeable. Since she was diagnosed, Ms Kerr has experienced periods of not being able to walk, trouble talking, vision impairment, and difficulty with fine motor skills. It's the seventh year Ms Kerr has organised the Rockhampton MS Swimathon, where all money raised goes to people in CQ living with MS. There were roughly 80 participants in the 12-hour relay event. Ms Kerr said she was delighted to see people taking part and bringing friends along to help raise awareness about the condition. Although it can be emotionally draining to constantly educate people about living with chronic illness while also tackling daily symptoms, Ms Kerr said she felt it was vital work to help increase compassion and understanding. She said fatigue was one of the biggest challenges to overcome on a daily basis, mainly because people with a chronic illness or disability feel pressure to present a mask of normalcy to the world. Raising awareness about MS and reducing the mystery around it also helps those living with it to feel more comfortable being honest about how they're coping, she said.